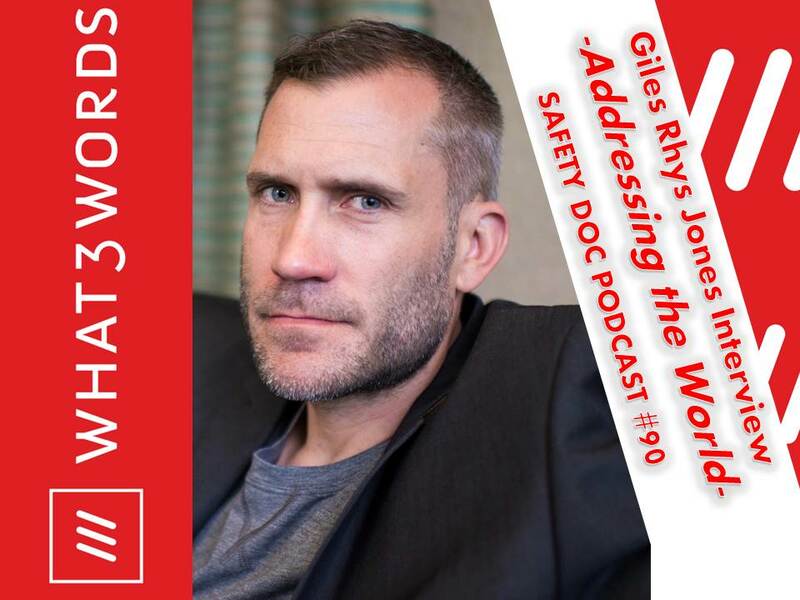 PODCAST – Giles Rhys Jones, Chief Marketing Officer for what3words, was interviewed for this episode of The Safety Doc Podcast. Dr. Perrodin contacted Giles after recently learning about what3words and instantly realizing its potential to recast swaths of school safety protocols. Giles and David discuss how w3w has interfaced with, and improved, rescue platforms and the potential ways the system might benefits schools. With 55 million students attending school daily in the United States, w3w could immediately have a profound impact on improving school safety. Giles shares the fun story of a comparison of two persons assigned to deliver packages to addresses. One was provided traditional mapping options and the other with what3words. The person with w3w not only delivered the packages faster, and without having to seek clarifying directions, but also was happier with the activity! what3words (yes, all small letters) is a really simple way to talk about location as the company’s geospatial engineering team divided the world into a grid of 3m x 3m squares and assigned each one a unique 3 word address. It means anyone can accurately find any location and share it more quickly, easily and with less ambiguity than any other system. The service can be used via the free mobile app or online map. It can also be built into any other app, platform or website, with just a few lines of code. You might not be aware of the software, but it’s already integrated into several everyday platforms. For instance, car navigation systems are shifting to the precision of what3words. Mercedes-Benz is the first car company to integrate what3words into its in-car navigation systems. Drivers with compatible models can now say or type in a 3 word address to get directions to a precise 3m x 3m location, anywhere in the world. The adoption of what3words shows the company’s commitment to a premium and intuitive customer experience and sees Mercedes-Benz leading the way in destination input. In a recent survey of new car owners, JD Power found that car navigation systems being difficult to use and inaccurate is one of the most frequently reported problems, along with voice recognition issues. The automotive industry has struggled to improve these features, and a significant reason is that the world’s street addressing systems are incompatible with modern navigation needs, and especially voice input.‘Street addresses were just not built for voice input’ says Chris Sheldrick, CEO and co-founder of what3words. ‘15 Ammanford Road and 50 Ammanford Road are hard for a voice system to distinguish between, and many road names aren’t unique. There are 14 different Church Roads in London, and 632 Juarez streets in Mexico City. Street addresses can also be difficult to pronounce correctly. The town of Godmanchester, is actually pronounced ‘Gumster’. Mercedes-Benz is known for innovation, so it’s no surprise to us that it is the first automotive company to integrate our system into their vehicles’. David identified several benefits that what3words would bring to existing school safety practices. The first is the ability to map an entire campus. If a student is hiding in unfamiliar area of a campus due to an intruder, that student could use the w3w app to convey his or her specific location to emergency responders. Dr. Perrodin’s second point is carried forward from his previous podcast in that what3words solves the age-old problem of what to do if an evacuation site or re-unification site is not available due to a myriad of reasons, including a larger perimeter established by law enforcement that encompasses those pre-determined locations. W3W efficiently allows for sharing of the evacuation or re-unification site as part of “working the problem” by authorities. It prevents people from locking in on a sub-optimal outcome of heading to a location that might not even be available as dictated by the dynamic context and situation.